Looking for a fun treat to make to show your loved ones how much you care this Valentine’s Day? These strawberry Valentine Spritz Cookies are absolutely delicious. And you won’t believe how easy these decorative little cookies are to make! Spritz cookies are not just for the Christmas. I use my cookie press year round for holidays, birthdays, and other special occasions. Using a cookie press is a great way to make a ton of cookies in a short amount of time. I used to have an antique cookie press that was my grandmother’s, but it was destroyed when a pipe burst and our house flooded. Since then, I’ve had a variety of cookie presses. However, I haven’t been really pleased with any of them until I purchased my Oxo cookie press. Unlike other cookie presses, the disks for the Oxo cookie press are metal, just like the ones from my grandma’s press. Plus I love that it has a non-slip base so that the cookie press won’t slip while you are in the middle of extruding your cookies. I had no problem using my favorite spritz butter cookie recipe with my new cookie press. What I love about the Oxo cookie press is that you can purchase seasonal disk sets in addition to the 12 it comes with. When I saw this cute Springtime cookie press disk set, I knew I had to have it. I just love the double heart and the love disks. They are just perfect for making Valentine spritz cookies. Keep reading to see how I made my favorite strawberry spritz butter cookie recipe or scroll down to the bottom for the printable recipe. Preheat oven to 400 degrees. With an electric mixer, cream the butter. Mix in the sugar, egg yolks, strawberry jam, vanilla, and food coloring until well combined. Stir in the flour. You may have to use your hands at the end to get it all incorporated. Use a cookie press to form the cookies into heart shapes. Make sure the cookie sheet you are pressing the cookies onto is cool and ungreased to ensure the cookies will stick. To make these Valentine spritz cookies, I used the Love, rose, heart, and the double heart cookie dies found in the OXO Good Grips Cookie Press Springtime Disk Set. If you like, add sprinkles to decorate. My daughter used pink sanding sugar and heart shaped sprinkles to decorate ours. Bake for 7 to 10 minutes. You want the cookies to be set, but not yet browning. Allow to cool completely. Makes about 6-8 dozen cookies, depending on the disk you use in your cookie press. Just click the little printer icon below to be taken to a printable version of this strawberry spritz butter cookie recipe. Mix in the sugar, egg yolks, strawberry jam, vanilla, and food coloring until well combined. 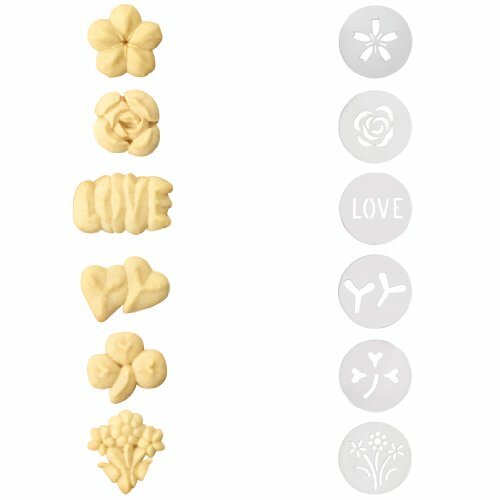 Use a cookie press to form the cookies into heart shapes. (Make sure the cookie sheet you are pressing the cookies onto is cool and ungreased to ensure the cookies will stick.) Add sprinkles to decorate. Bake cookies for 7 to 10 minutes. You want the cookies to be set, but not yet browning. Allow to cool completely. With their light delicate texture and just the right amount of berry flavor, this strawberry spritz cookie press recipe is one of my favorites to make throughout the year. If you use your cookie gun to make them into heart shapes, these cookies would make a great little gift for someone for Valentine’s Day to let them know how much you care! So tell me… Do you a cookie press? Are you doing any baking for Valentine’s Day this year? Be sure to leave a comment below, I would love to hear from you! I had no idea you could get different disks for a cookie press! Thanks for visiting Carol! You will have to let me know if you try them. These look so cute and fun. Thank you for sharing on The Pin Junkie pin party. One of my favorite cookies! I have two cookie guns and they are both not working right. Time for a new one! Love that heart candy in the middle! Thanks for linking up with Funtastic Friday! Jen, these cookies are a family tradition, starting with my grandmother, to my mom, to us. We love them. So flavorful and soft, I can’t ever stop at just one. Or even two! LOL These Valentine’s cookies are adorable! THere is nothing beter than a spritz cookie to melt in your mouth!